Media captionSt Patrick's Day celebrations are taking place across the world. St Patrick's Day celebrations have taken place around the world. More than 400 landmarks in more than 50 countries turned emerald as part of Tourism Ireland's annual Global Greening initiative. Across the island of Ireland, young and old of all nationalities lined the streets, dressed in shades of green. The annual parade in Downpatrick, County Down, began with the traditional vintage rally through the town. The other main parades in Northern Ireland, including those in Belfast and Londonderry, drew large crowds into the spring sunshine. In Dublin, revellers gathered along the route of the parade, which was attended by Irish President Michael D Higgins. In his traditional St Patrick's Day message, President Higgins greeted "extended family across the world". "Wherever you may be, and in whatever circumstances, you are part of Ireland's global family joining with us as we celebrate our shared Irishness, its culture, heritage and history," he added. The theme of Dublin's parade was storytelling. It featured marching bands from Ireland and abroad, including the US and Germany. Derry's city centre was a blaze of colour as the city's biggest ever St Patrick's Day parade filled Shipquay Street with a vibrant display celebrating youth and culture. More than 10,000 people lined the pavements, despite the windy conditions, as over 700 performers from community, arts and sporting groups brought the story of Tír na nÓg to life. Derry City and Strabane Mayor John Boyle, who led the parade, said it was a "tremendous day for the city and district when young people in particular showcased their tremendous imagination". He said the city had joined together to promote a positive image. "Over the weekend we have celebrated cultures and traditions from around the world, and embraced the rich tapestry of ethnicity that makes our city such an inclusive and welcoming place," he added. London, Birmingham, Manchester and Edinburgh are among other cities hosting parades and festivals. Saint Patrick is the patron saint of Ireland, he lived in the 5th century AD and is understood to have played a major part in converting the Irish to Christianity. It is believed he is buried in Downpatrick, County Down. Taoiseach (Irish Prime Minister) Leo Vardakar travelled to Washington DC for St Patrick's Day celebrations at the White House last Thursday. 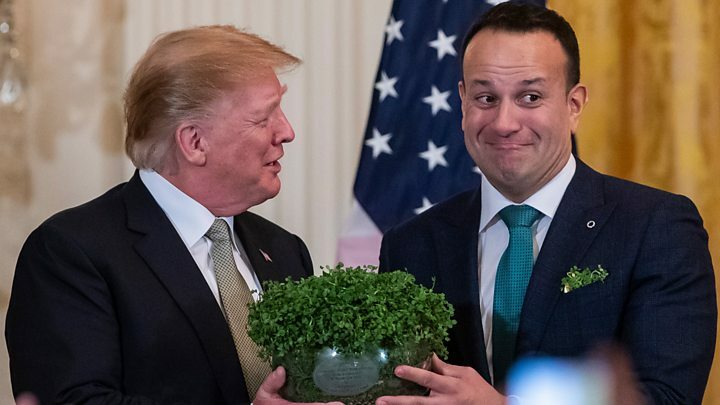 As is tradition, he presented US President Donald Trump with a bowl of shamrock. Mr Trump said he was planning to visit Ireland later this year. Although most events across the island of Ireland are either finished or beginning to wind up, in Belfast, Féile an Earraigh has been running from 1 March and a range of events are ongoing over 17 and 18 March. Details of events in other cities can be found by clicking on the links below. Full programme for Armagh council's St Patrick's Festival. Full programme of events in Newry. Events in Enniskillen and Omagh. Full festival programme for Dublin. A full programme for Manchester is available here.